I am planning a retreat with Selena Delesie, called the Mindful Leadership Retreat at the April 22-24th, 2016. You can read about it here, and register here. I want to share why I am running this retreat, why at my home, and why now in my life? I want to disclose my intent! 1.) Share. What holding this retreat does for me that it holds space for others to learn and share. The magic that can happen over a three day period with a small group of people is incomparably rich as compared to short workshops. It is the ambience and generative experience I wish to replicate – especially for those who have NOT had this opportunity before. 2.) Invite people into my space. Where one does one’s important life-advancing work is as important as discussing what the work is. 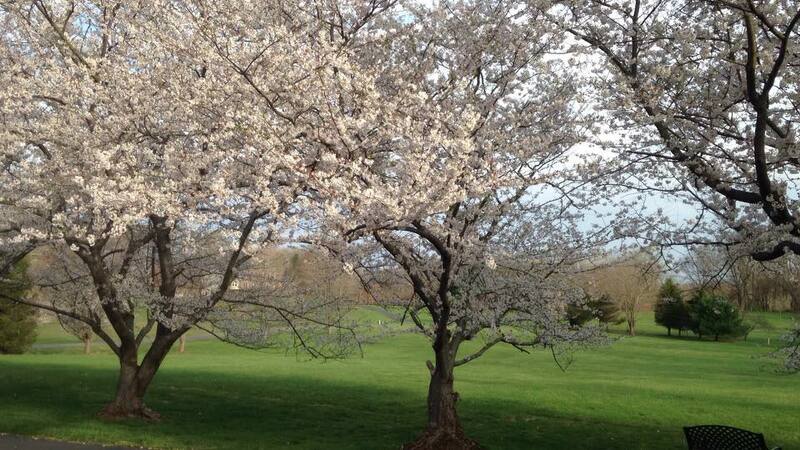 The learning environment you will come to has both beauty and serenity. If you want to make a meaningful connection with someone at work, it is best not to do so with a desk between you. Take a walk, go to a space where there is openness. That will have a beneficial effect on your communication. Learn why by experiencing it here. 3.) Spread the wealth of mindfulness and of my past influencers. I want the effect to be far-reaching. I want to know that you’ve gotten what you needed by coming to this retreat and that I can support you even after it is over. I have my own influencers to thank. And want you to carry the torch forward. 4.) Collaborate with an amazing woman in doing something new. Learning to go with the energy of the present moment is a gift – being able to let go of past stories, and create meaning and value in one’s life. If Selena and I can model a fresh new collaboration like ours for you, I’ll feel great – and you’ll see the reward in our faces for having tried something new and a bit scary. 5.) Create close connections between people. Quite simply put, that’s where the magic happens and where the problems are solved. I want others to see how they can foster that happening as well. What are some concrete Mindful Leadership exercises that you can expect from us? Checking in: We will use checking in to launch each day in the morning and afternoon. Temenos: Influence Mapping / Vision Mapping – exercise in self-reflection, mapping one’s influences and envisioning the future. Each person will be narrating their influence and vision maps during the retreat. This is story telling, a leader’s gift. Jim and Michelle McCarthy: Personal Alignment exercise – identifying what you want, and what is blocking you from getting there. Identifying your core resources for overcoming these blocks. Grove: Clean Language Questions – will be taught to help participants train their attention on others – and to remain judgement free – a good practice for information gathering prior to reacting – for any leader. Caitlin Walker: Systemic Modeling exercises, building up the power of the group to notice (each other) and take advantage of the diversity of experience in the room. These tools are simple and therefore very powerful. We want you to take back some things that you can use right away! Discovering, sharing and implementing your own intentions is what Selena and I will help you do at the retreat. The downsides of remaining with the status quo, not fulfilling yourself at work, of faltering with interpersonal or business relationship issues, and of observing disengaged workers are too many for us not to be doing this work together with you. We do hope that if this appeals to you, you will sign up now, or join us on the upcoming webinar Q&A sessions. Details to be posted soon. Intent based leadership is described in Turn the Ship Around! : A True Story of Turning Followers into Leaders – one of the very best leadership stories I’ve read. I attended Jim and Michele McCarthy’s team-building workshop – in April 2015. It was an amazing experience learning how to create great teams within the span of one week using the The Core Protocols. If you’ve never read of them before or want to familiarize yourself with them, you can download or print the Protocols here or buy a small printed version here. I went to Bootcamp because I am tired of workplaces where I cannot see the innate energy, skills and gifts people have. I see lifeless disengaged employees and I want that to change. I wanted to experience working in a different way, for a week, where people feel connection. I want others to benefit from what I learned is possible. In this Bootcamp, experimental learning requires an individual commitment to use the protocols, including all of the built in safety features. One of the first instructions to Bootcamp participants is: You are entering a simulation and you must pretend that the Protocols will work during the simulation. There is no doubting their efficacy during bootcamp. Use them. Experience them. You will see the results. It’s like entering a new building. You cannot appreciate fully from looking at the floor plans alone. I believe it is in the doing that we learn how and why. Before Bootcamp, we had a 100 page pre-bootcamp reading assignment to prepare us for this journey. We came from about 7 different nationalities and continents – we were about 15 people in total including a 13 year old. Below I share just a few salient aspects of Bootcamp and below that some other links for those who are still curious. During the Bootcamp itself, before working on the product that we were assigned to deliver by the end of the week, team members get to know each other. The Personal Alignment itself takes the the form of articulating a virtue (love, courage, trust, presence, joy, health/self-care) – one that if the skies rained down this virtue in abundance, all the ‘blocks’ to your personal achievement would be removed. This aspect is about individuals discovering what they want, disclosing it, and then asking the team for support in the form of a signal/response pair. Supporting each other in getting those virtues allows the team to be be strong! I see a lot of analytical, technical, engineering type problem solvers slaving away at their day jobs. I wonder if they find joy, connection, support, and a sense of being ‘in’ with their team on a daily basis… I wonder if they know that over time, they will burn out from not feeling connected to others at work in a deeper way. One of the reasons I value the Protocols, specifically Personal Alignment, Check In and Ask For Help so much is that they bring this me a strong sense of being connected to each member of the team. Work should bring joy, and with the connectedness and safety, people will produce at their best. At camp we used the Investigate protocol to learn more about each other. It is a time of deepening relationships on the team as the Alignments are explored. One person on the team at my Bootcamp wanted more Courage. When he shared his signal throughout bootcamp: ‘I want Courage’, anyone present at that moment would yowl like a wolf as that was the response he asked for! Alignments allow for personal growth. Folks are encouraged to write down the evidences they will have when they know they are exhibiting more of their virtue. They are encouraged to report those evidences to team members, and ask for help when they need it. This is incredibly powerful. After personal alignments, the team performs a web of commitments ceremony in which all the alignments, signals and responses are shared. We also share our desired evidences. It’s a beautiful creation – coming from the increased bandwidth, self-disclosure, getting to know one another. Before making products, we create a shared vision. This is a brief statement about what we want the world to be like as a result of the product we are making. We create the vision before we even know what product we will be making… it is very aspirational, very inspiring as well. One feels lifted above the dross and worry of procuring the stuff we’ll need…. and we did need stuff – read more about that later in the Managers section. After the Web of Commitments, we go to work producing. Now that we are more deeply connected with one another, we will reflect our best selves in our products. We continue to use Ask For Help, Check In, Check Out, Investigate, Intention Check, Decider, Perfection Game, Resolution, Protocol Check liberally as we produce stuff – in addition to to sharing our alignment prompts. We are completely self-organizing using our communication tools and discovering and sharing our talents. Our team made a lot of cool things. There were sub teams of people creating things like a Gong stand, a robotic proximity sensor with stuff bought at Radio Shack, paintings, a Greatness Manifesto, an emotion/check in cube, a game, music and so forth. By the end of the week, our goal was to showcase our best product to the ‘Managers’. Jim and Michelle McCarthy who hosted the Bootcamp I attended played the ‘Manager’ role. They showed up at times, as managers normally do, seeing how things were going, to see if we were using ‘Ask for Help’ protocol. One of the big things folks get wrong with respect to management is not asking for help enough! This is true on every Bootcamp they’ve ever run – and I’ve been noticing this a lot as a cultural phenomenon back at work. People who need things are afraid to ask for them! We had several team members who had been to a handful of bootcamps before, and they were not shy – and whatever support we needed (stuff to make our products), we asked for from Jim and Michelle, or just procured the items ourselves. Like some of the other newbies, I fell short of asking for help enough at Bootcamp by my own admission, but I’ve been practicing more since then. For example, I asked for a new laptop at my coaching gig and got it (the desktop I had was horribly outdated and slow, but I hadn’t thought to ask). I’ve been observing this lack of asking by others at work. It is a pervasive phenomenon that I had not really noticed much before. At the end, we presented our best product to the managers. We had everything available to see, but getting to unanimity on the product to showcase was HARD work. Folks had invested a lot in some of the products, but because we had the ‘Decider’, ‘Resolution’ and ‘Intention Check’, ‘Check in’ and ‘Check out’ protocols, as well as our alignments, we were able to get all onboard and the best product out the door on time. You can see our product, the Greatness Guild, and follow it as it continues to grow as an outcome of our team’s work. McCarthy Bootcamps demonstrate that installing ‘software for your head’ (the Protocols) magnifies a team’s capacity by helping people communicate! See this invitation to the Fall 2015 Bootcamp and sign up now if you want to experience it. If you want to dig deeper on your own after reading this post, read Software for Your Head or listen to the McCarthy Show podcasts. A good podcast to start with is an interview with a Bootcamp grad who started using The Core Protocols at Microsoft. 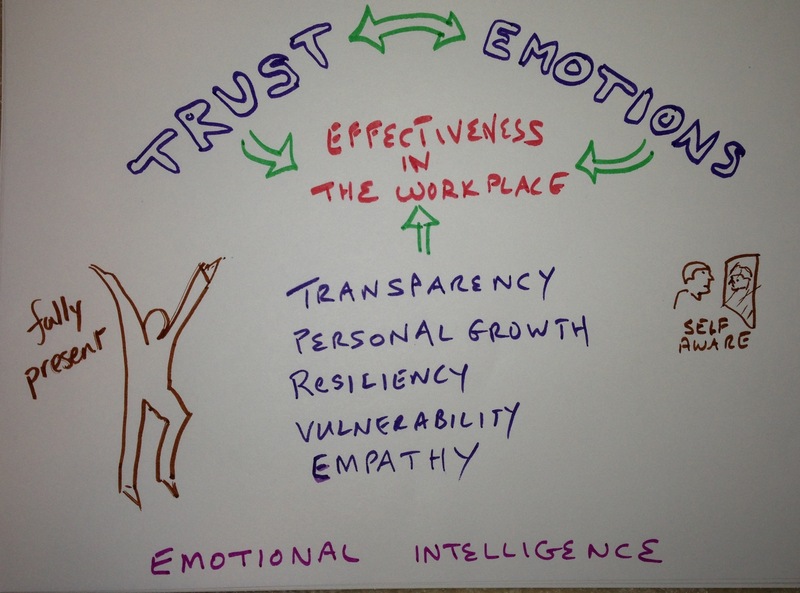 I am glad; writing this post on trust and emotions in the workplace. I am sad/afraid; I cut out a lot of material I wanted to include. I will create future posts. I am glad; getting better at drawing, slowly. I am glad; respecting people’s time, wanting to be concise, wanting to keep it simple. I am mad; not having time to write more frequently. I am glad; I want to engage in a discussion with my readers! Trust is the real fuel of a productive team. Processes may be useful to organize complex knowledge work, but without trust, even the cleverest process will suffer. Knowledge work involves creativity which involves taking risks (including the risk of making mistakes). Great teamwork requires trust and vulnerability among team members. How do team members get to this state? What if they started with a clean slate every day or at the start of meetings- by sharing the current state of their emotions? When I am able to do this and be welcomed without comment, I am ready to tackle my day, my meeting or my personal interactions so much more openly. If others do the same, even more so. I’ve been thinking a lot about emotions in the workplace, specifically how suppression of feelings can lead to so many unproductive interactions and missed opportunities. We may enter the workplace not feeling whole. We may say ‘Hello’ and ‘How are you?’ to our colleagues. We leave part of ourselves behind, hidden. This is the norm. We often don’t know what professional and/or personal stresses, joys, fears, sadness team members are carrying with them. We don’t have an acceptable way to switch on our emotional selves. Instead, we arrive home and vent our frustrations about work at the dinner table. People can connect to my humanity (and me to theirs). Explicitly hearing someone’s feelings of sadness, anger, joy helps me trust a person faster, knowing him or her as a full, rich human, not just as an actor functioning in a process. Vulnerability, the willing to let ourselves be more fully seen is a great way to create trust. What emotions do you notice people are hiding in your workplace? When is it good to suppress feelings and when not? How might it feel to work in an environment where your colleagues welcome your emotions without judging you? How would it feel to share and have others share observations, feelings, needs and requests instead of blaming, placating, and coping in incongruent ways? How might bonds of trust between colleagues improve if you knew more about their past influences and their future ambitions? Intro to the ‘Ask for Help’ Core Protocol – I’m modelling how! Asking for Help is one of the key skills your team members need to have if they would like to have successful outcomes, agile transitions, or superb products. Sadly, many people shy away from asking for help due to cultural conditioning as well as rewards and compensation based on individual performance. I am going to model for you the ‘Asking for Help’ protocol. This post is really about my asking you for help (see below in a minute). But first, I would love to share with you a little background on the Core Protocols for great teams. If you are not familiar with the Core Protocols that originated with Jim and Michele McCarthy, pick up a new and valuable book called ‘Creating Time’. In this wonderful introduction to the Core Protocols and Commitments, Vickie Gray tells us the story of the Time-Eating Monster that lurks around every meeting and every interaction in the workplace feeding on the slightest opportunity to gobble up your precious time. The monster does this by feeding on dissonance, indecision and inaction, insecure egos and more. But you can slay the monster and indeed you must. 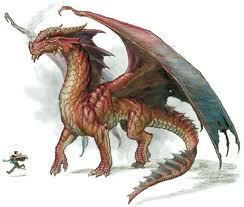 The Core Protocols, of which ‘Ask for Help’ is one, is the way to slay the monster. And one of my offerings to you is to teach your teams the ‘Core Protocols’. The book does introduce a subset of the full set of protocols, interwoven with the storytelling. It makes a compelling case for improvement that you will relate to! Now I will model the ‘Ask for Help’ protocol myself. It makes me fell a little vulnerable, but it will help me succeed! Will you help me find an agile transformation gig in the DC area? Saying No is perfectly ok. The Core Commitment for this protocol is not to discuss the request further once someone says ‘No’. To help you out in answering my ‘Ask for Help’ question, I have summarized what I want to work on below. Teach you how to climb down the ‘Ladder of Inference’ and break down assumptions within your communication. Guide you, your team, or your executive leadership on a Temenos retreat to create a basis for developing strong teams and missions. Please contact me at andrea@connections-at-work.com if you know a place that needs my help! My preferred work location is still in the immediate DC metro area. If you can’t help, thanks for reading anyway, and hopefully you have enjoyed learning about one of the ‘Core Protocols’.